Can You Eat Out and Stay Healthy? Yes, yes, yes you can! It may not be easy at first, but a little effort will go a long way in keeping you healthy while still allowing yourself the enjoyment of eating out. Some chain restaurants have implemented special dishes or menu sections featuring meals that are lower in calories, fat and sodium. Most fine restaurants will accommodate you if you wish to order a dish that is lighter. These strategies will help you make better choices in the restaurant. Challenge: All restaurants serve portions well in excess of a real portion, often up to 2,000 calories (a full day’s allowance!). Solution: Share your meal with your partner or ask for a takeout container when your food arrives and put half away to bring home. If it isn’t on your plate, you are less likely to eat it. Challenge: You don’t know what is in the dish. Solution: Ask the waiter. If it contains cream sauce, Hollandaise or other rich, high-fat sauce, it can be eliminated or put on the side. Challenge: How the dish is prepared. Fried foods are very high in fat. Solution: Your best bets are grilled, broiled or baked meats, chicken and fish. Ask if vegetables are cooked in butter. Ask for steamed. Challenge: Salad dressings are notoriously high in fat and often there is too much on the salad. Solution: Ask for oil and vinegar based dressing and have it on the side. Challenge: You are starved – you didn’t eat all day, saving your calories for dinner out. Solution: this is a big mistake. More than 4 hours after your last meal, your glucose drops and your body calls for food. When you are very hungry, you will eat fast and too much, before registering that you are full. Have a snack if it will be more than 4 hours between your meals. A small fruit should hold you. And eat s-l-o-w-l-y. If you use these few strategies, you will consume fewer calories and fat and can eat out without guilt. Makes one 8×8 tray. I usually double it. It can be frozen, then defrosted and reheated, covered. 1/2 lb. medium egg noodles, parboiled. Strain; do not rinse. *I use reduced and/or fat free cottage cheese, milk and sour cream. It doesn’t change the taste but cuts out a lot of fat. Add all ingredients, mix well and place in greased 8×8′ baking pan. Top with cornflakes if desired. 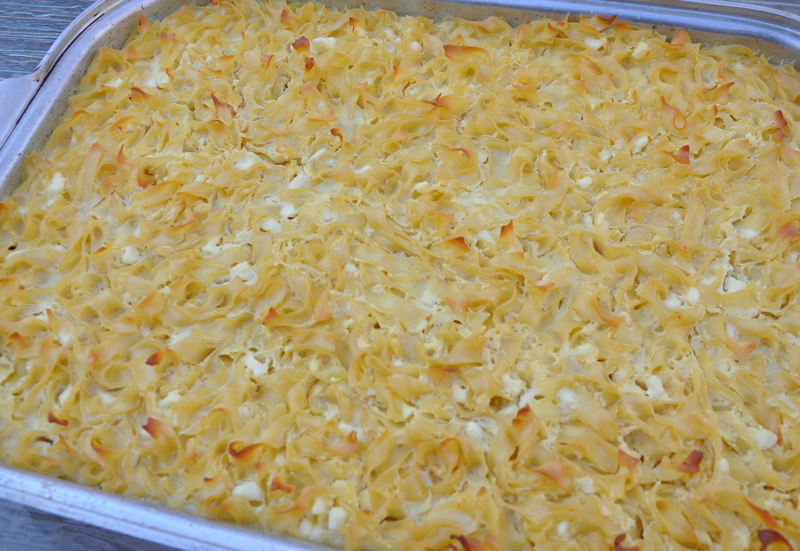 Bake at 325 degrees for 55 minutes or until the noodles begin to brown. 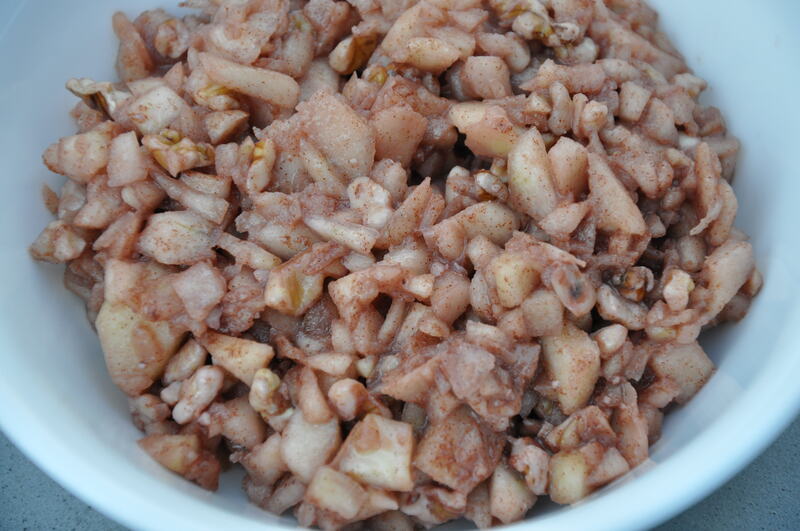 Remove and let settle for 10 minutes before cutting. Yesterday I took home a wonderful cheese I had never had before. I got it at a store where the owners know their products and how to match your tastes with a selection of cheese. I took it home with a loaf of bread from the French bakery down the road. Along with a glass of wine and simple mixed salad of 4 lettuces, small multicolored sweet peppers, mushrooms, tomato and good extra virgin olive oil and Modena balsamic vinegar, called it dinner. It brought me back to Riomaggiore, where my husband and I stayed 2 days last year. After traveling around Italy, eating in restaurants (not that i am complaining about this at all), we wanted a simple dinner. Since we had a kitchenette and a view to die for, we tossed up some fresh pasta with pesto, a specialty of the region, with a fresh salad and grated parmesan reggiano, bread and of course wine. We sat and watched the sun set, living “la dolce vita” with the simplest of meals. I never felt so at peace. So last night evoked this memory, but without a view of the Mediterranean. I had to settle for the golf course out the back window. Artisan is a noun that describes a person who is skilled in a trade, especially in making things by hand . As an adjective, it has been used to describe high-quality, distinctive products usually made in small quantities or to special order. In the past years, use (misuse or overuse) of this term has exploded. Suddenly, every product is deemed “artisan” and we are supposed to believe it is of superior quality. You know a word has been commoditized when Burger King and Wendy’s, snack chips and drinks have artisan varieties. It’s a shame that mega-corporations usurped a term that means crafted in small batches, which they surely do not do. Yet somehow, they have convinced consumers that their foods are upscale and they are selling those potato chips to “sophisticated” buyers. It’s a shame that many people can’t differentiate the true artisan foods from the commercially processed garbage in a prettier package. It’s still a package of processed food stuff. But my big gripe here is less about the quality of the food than the dilution of a term. As a “wordie” (yeah, I made that up and it doesn’t work as well as “foodie”), I take offense when big business takes the liberty of redefining the English language. What a meal it was last night! I never practice my menu before subjecting my friends to my experiments, nor do I do a lot of tasting as I cook. I feel that if you use good ingredients, you can’t go that wrong! Fortunately, my worst outcomes are always palatable, if not just right. This dish is a winner and versatile enough to use on other kinds of fish. With tilapia being a reasonably-priced and sustainable variety however, this recipe is sure to make every fish eater and host happy. This recipe serves 6. Method: Lightly oil the bottom of a baking dish. Place the scallion pieces horizontally under each fillet Put the wider halves of the fillets in the baking dish Spread a 1.5 inch “strip” of pesto down the center lengthwise. Top with the narrower half of the fillet. 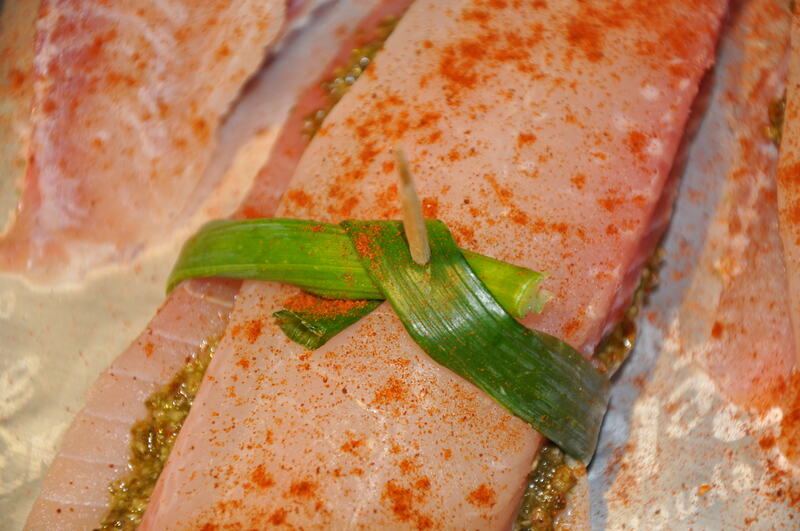 “Tie” the scallion around the bundles. If they are a bit short or too brittle, use a toothpick to hold the scallion tie through cooking and remove prior to serving. Sprinkle with paprika for color. Bake at 350 degrees for 20 minutes. Serve with roasted tomatoes and a grain. 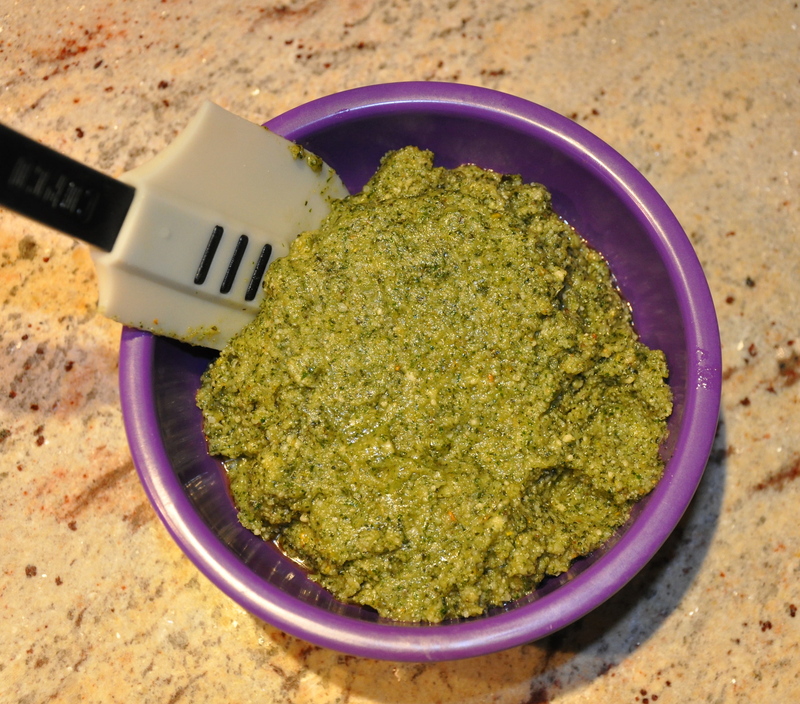 Pesto Sauce: easy and delicious! Pesto sauce is a great accompaniment to pasta of course, but yesterday I used it in a baked fish recipe. It was scrumptious! I altered the usual recipe, halving the olive oil, so there would be less “oozing” when the fish was cooked. Why waste this precious extra virgin olive oil? Here is the standard recipe. In a later post, I will note the changes to this recipe as incorporated into the fish dish. Chop basil/parsley, garlic and pine nuts briefly in food processor. Scrape bowl. Slowly drizzle in olive oil until blended. Add cheese, blend and serve with whole wheat pasta. Remember it goes a long way, so don’t drown the pasta in the sauce. It is used more like a butter. Put a tablespoon on the pasta. It will melt and coat the pasta. It is hard to find a good tasting whole wheat pasta with a good “bite.” I like Trader Joes’ brand best, especially their thin spaghetti in the cellophane wrapper.